Being a student photographer here at Luther has given me a new perspective. I initially wanted to title this post "Seeing the Liberal Arts Experience From a New Angle," but as I thought about it, I realized that I'm not really seeing it from a new angle so much as I'm seeing it new from every angle. My work is in no way confined to one building or department. I could take a portrait of an English professor one day and photograph a soccer game that same night. It's this variety and, to an extent, unpredictability that really brings my job to life. Every week, every day, every assignment is a brand new experience waiting to be had. The following photos (and explanations of them) should hopefully give you a sense of the diversity of assignments I've had during my time as a student photographer. A lot of the time, my work doesn't really feel like work, and it's while shooting campus scenes that that sentiment becomes most apparent to me. 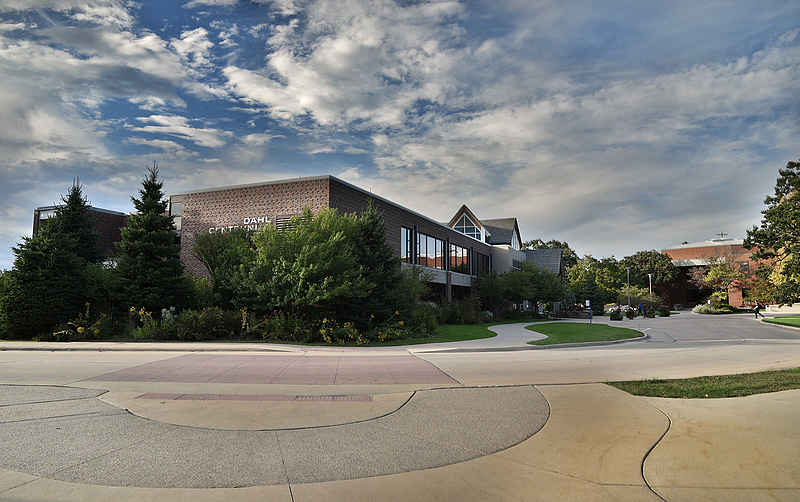 Getting to go out on your own time and photograph campus in whichever way you choose is about as liberating as it gets. This photo of Dahl Centennial Union is easily one of my favorite campus scenes that I've taken. There are many reasons why I love this photo. Not only is it one of the least photographed sides of the Union, it's also a side that not a lot of people see. When people think of the Union, they think of the beautiful, angular facade that stands at the front and center of the building. On top of that, any student that may approach the building from this angle is probably more worried about safely crossing the street than staring at a building, so it comes as such a pleasant surprise to take a step back and see a side of campus that is so often overlooked. Of all of the different places and settings that I find myself in this line of work, my favorite would undoubtedly be portrait work. 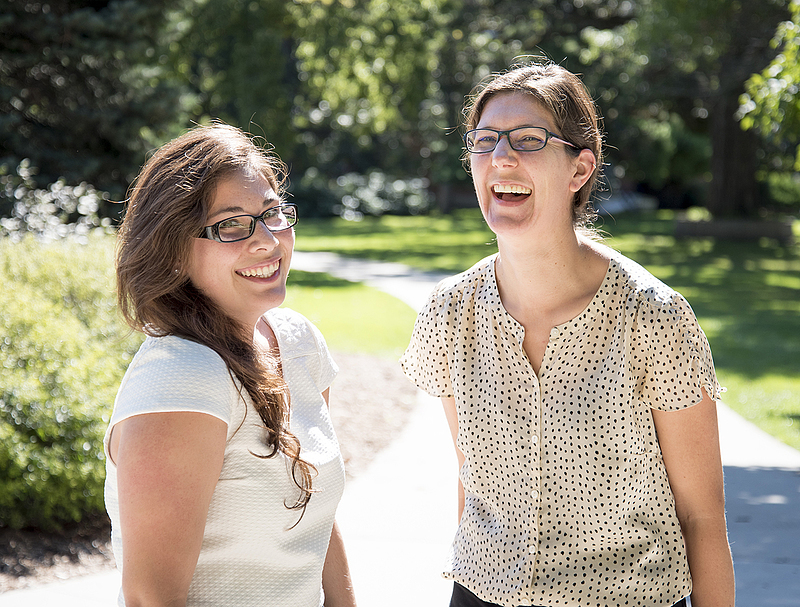 This photo of Sandra Cardenas '16 and Angela Kueny, assistant professor of nursing, was the result of a very last-­minute assignment on top of what was already a stressful day for me. My mind was in a thousand different places, and it was likely showing in my work. However, as our 20-minute photo shoot progressed, I couldn't help but be uplifted by the joy that this student/faculty duo had and with which they conducted themselves. They might not have known it at the time, but they saved me from what would have otherwise been a really rough day. While athletics comprise a considerable portion of my assignment load, this soccer game wasn't like most sports assignments for me. After making my way down to the soccer field and finding a spot on the sideline, I found myself in a predicament that I like to call "right place, wrong lens". In a hurry, I had grabbed my 24­-85mm lens, a lens that didn't have nearly enough zoom capability to capture the players from the side of the field. Since running out onto the pitch wasn't an option, I decided to let the other photographer that was there take care of the close up shots of the players while I went for some less conventional photos. I made my way around the field to where our team was located, and it was there that I took the above photo. 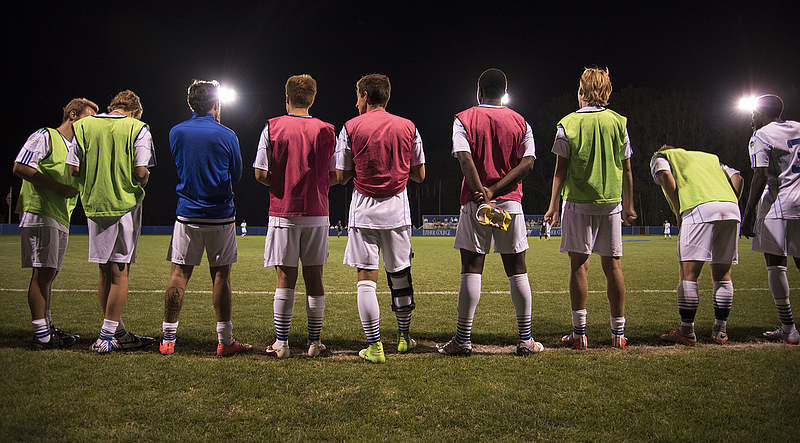 It was fun to capture a side of a soccer game that most people don't get to see: the players' point of view. Being a music major, it's no surprise that I jump at the chance to photograph any sort of opera rehearsal. 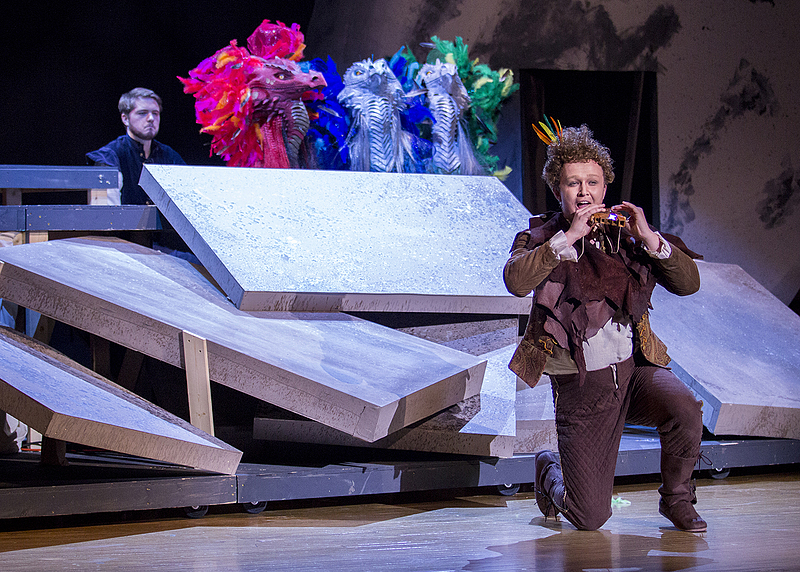 While the majority of opera performances at Luther happen in the form of collections of short scenes, the music department does put on a full­-scale opera performance each spring. Last year, it was Mozart's "The Magic Flute." With full makeup and costumes, and multiple stage settings, not all colleges are able to pull off a performance of this scale. It also wouldn't be possible without the caliber of musicians in the student body. Both Braun Oldenkamp '15, and Jimmy Deignan '15, pictured above, are extremely talented singers and performers along with every single person that had a part in the performance. One of the unspoken benefits of being a student photographer is that I can get an invitation to just about anything, from banquets in Peace Dining hall to concerts and picnics in Bentdahl Commons. Hidden benefits aside, I really do love being a photographer in social settings. One takes on a different role as photographer than they would at something like a concert or sporting event. It becomes less about being in a certain place at a certain time and more about just being there. I find myself in a lot of high ­stakes situations where I have to nail a certain shot, so being free to walk around and take photos at your leisure is always a relaxing change of pace, almost as much as photographing campus scenes. Being a student photographer here at Luther College has provided me with a lot of really memorable opportunities. I could have easily chosen twice the number of photos that I did, each with their own story. That's not a testament to what I've done so much as a testament to how much there is to do at Luther. I'm honored to be a part of such a high­ caliber team of photographers, and we are constantly kept busy with the sheer variety of events that happen on any given day. 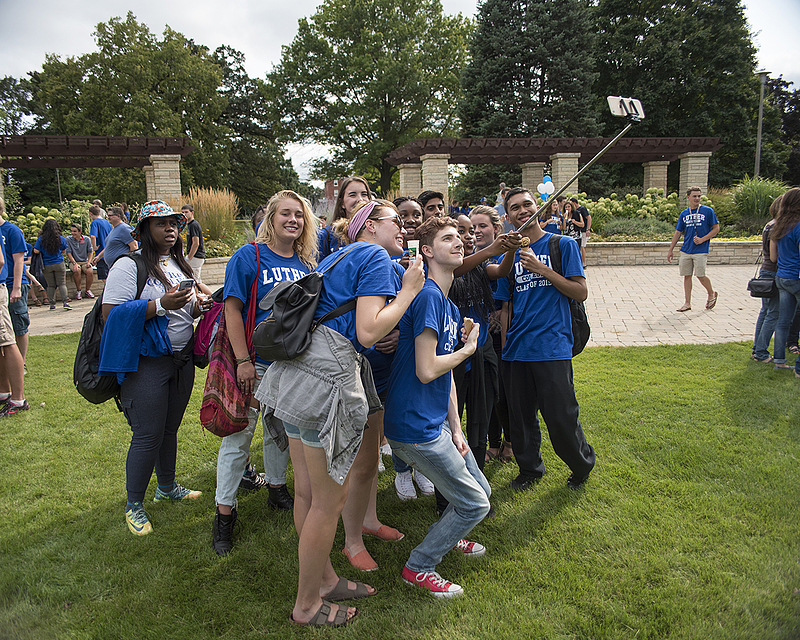 For those wondering how to become more involved here at Luther, the answer is simple: take up photography. Will Heller, Luther College class of 2016, graduated with a major in music and a minor in management. He worked in the Visual Media department as the Visual Media Fellow, supervising a team of "rockstar" student workers. As a student, Will worked as a photographer for the Luther College Photo Bureau for two years, including working for the Visual Media Department during the summer of 2015. His work has been featured in publications such as the Decorah Journal, the Des Moines Register, the Luther Alumni Magazine and Private University Magazine. Does the nursing major belong at a liberal arts college?